What Happened: Murder by Cubs. Seriously, somebody call Led Zeppelin because yet again, the song remains the same. 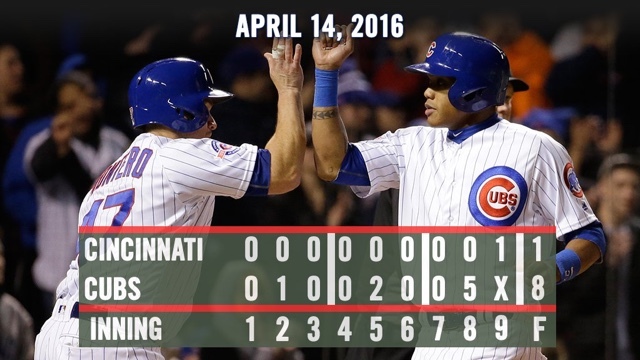 The Cubs saw a ton of pitches, scored a ton of runs and didn't let the other team score much. In fact, the only reason the Reds were able to get on the board at all was because of a deployment of the Grimmhole in the 9th. Firsthand Experience: I was actually able to go to last night's game, so I can tell you that the extra security measures in place outside Wrigley (metal detectors) didn't really add a lot of time to getting into the ballpark. We'll see how it does for a weekend game where the weather will be nice tomorrow, but for now don't plan on needing more than an extra 5 minutes to get into the park. But Let's Get Back To The Bryant: It seems I was a little premature in predicting that Bryant would get the power stroke going last weekend against the Diamondbacks. The most impressive thing about both Bryant home runs the last two games is that the chill in the air was really making it tough to get much on any ball hit in the air. So many balls last night from both teams were pretty well-struck and Bryant's laser shot was the only one to clear the fence. We Are Really Really REALLY Good: It's not like we've played a bunch of world beaters so far (the Reds could lose 100 games this year and the Diamondbacks and Angels definitely have their flaws), but you can only play who is on the schedule and the Cubs have done what great teams are supposed to do to bad teams: grind them into dust. The Cubs have scored more runs than anyone in baseball. They've walked more than anyone in baseball. They've seen more pitches than any team in baseball. And they've also given up the fewest runs and baserunners in baseball. Out of all the things they could have done to start the year, this is really the best case scenario. And we have the not-so-great pitching staff of the Rockies coming in for the next three days. The Rockies come in today at 1:20. The Rockies go with something called a Chad Bettis and the Cubs counter with Kyle Hendricks.